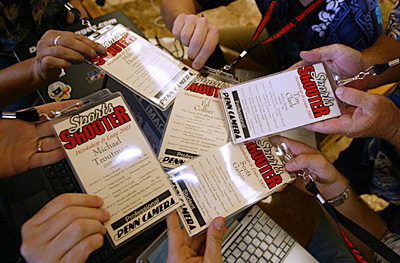 The Penn Camera/Sports Shooter credential holders at the 2003 Sports Shooter Workshop and Luau. Happy Holidays & a BIG Sports Shooter NEW YEAR to all! We hope that everyone had a health & safe Christmas/Hanukkah season. Look for many new product announcements over the next few months, especially as we get closer to the PMA (Photo Marketing Association) show February. As we get information on new gear, I'll surely pass it along. -- Microtech's BIG announcement: NEW - Microtech XP CF Xtreme II Pro card 40x Series *Sustained write speeds reaching 6.6MB per second *No special firmware needed from camera manufacturer to enable raw performance, will see performance gains on both Nikon and Canon Pro SLR platforms shooting either Raw or JPEG *Using same commercial design and construction that our current 22x Pro version carries, SLC construction *This card is designed to be one of the most robust Microtech CF card products to date *The previous 22x design carries a field failure rate of less than .16% (one out of every 600) real figures are far less. *Pro users will achieve 15% - 25% increase in performance of this card - this performance will vary depending on the camera system and file type shot and stored, as well as type of frame mode - single or continuous mode. * The pro user will receive the same pro-active, unmatched technical support from Pexagon. * Delivery of these cards will begin in early January---Stay tuned! --Nikon's D2H's have been coming in on a regular basis, and we hope to have all of our orders up to date by the end of 2003 … SB800's ENEL4 Batteries, and the WT1A Transmitters too! --Canon's EOS1D cameras have been increasingly difficult to come by, with speculation of a new product just around the corner. We have more 1D's on order, so if you're interested in one, call me, and I'll check stock. --The Media for Kodak, Fuji and Olympus printers are always in stock, at very competitive prices. If your company uses one of these printers, and you don't already purchase paper and ribbons from us, you should. Call me for quotations.